This is a once in every 10 year trip you won't want to miss! This journey will provide you a deeper understanding of scriptures traveling through the lands of the Bible. You will get a closer look at the life of Jesus Christ and His mission of redemption. Wen you make this journey in the company of friends and others of the like mind, you can look forward to an unforgettable experience. Picture yourself sailing in a boat like the disciples on the Sea of Galilee (“And Jesus said to them, follow me and I will make you become fishers of me” Mark 1:17), floating in the Dead Sea, seeing our Lord Jesus’ birth place in Bethlehem, walking the streets of Jerusalem and having communion at the empty tomb where Jesus rose from the dead (“He is not here; He has risen, just as He said. Come and see the place where he lay” Matthew 26:6). At the end of this tour two things will most certainly be changed, you, and your understanding of the Bible. 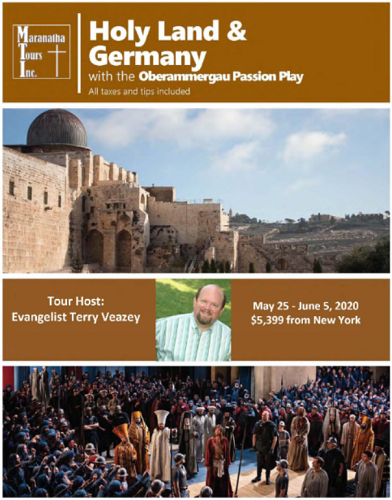 After we travel to the Holy Land we travel to Germany where we will attend the Oberammergau Passion Play! In 1633, in the quaint Bavarian town of Oberammergau, gripped by war, poverty and plague, the villagers of Oberammergau vowed to put on a ‘passion play’ every ten years if their village was spared. They survived and performed the very fist Oberammergau Passion Play in 1634. Ever Since, their descendants have carried out this pledge, giving you the opportunity to attend this unique experience in 2020. PLEASE CLICK ON THE TOUR BROCHURE LINK ON THE LEFT FOR DETAILED INFORMATION INCLUDING HOW TO SIGN UP!